Maisha Quint is a project director at CompassPoint. As a project director, Maisha leads (or co-leads) several kinds of offerings for CompassPoint program participants, including cohort leadership programs, consulting engagements, and public workshops. She also plays key program design, project management, and facilitation roles within CompassPoint's highly collaborative project teams. A Bay Area native, Maisha’s 20-year career has been as a social justice organizer, cultural worker, arts and policy manager, and communications director. Most recently, Maisha served as a Multicultural Fellow at the San Francisco Foundation, where she led their $3M Arts & Culture portfolio, as well as co-designed working groups for Immigrant and Refugee Rights and Youth Organizing. Additionally, she helped develop strategies for the foundation’s $8M housing and anti-displacement efforts throughout the five-county Bay Area. 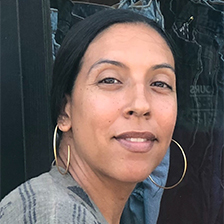 Maisha served as the Community Programs Director at EastSide Arts Alliance, where she led efforts to advance intersectional approaches to cultural strategy and place-based equity, particularly with the development of a Black Cultural Zone (BCZ) in East Oakland. Prior to her work at EastSide, Maisha worked at Legal Services for Prisoners with Children as the Communications Director and Family Advocacy Coordinator, a statewide network of family members advocating for policies on behalf of their incarcerated loved ones. She has organized with the Committee to Free the San Francisco 8, Stop the Gang Injunctions Coalition and the Committee for the Defense of Human Rights, and several other grassroots campaigns. Maisha currently serves as an Advisory Committee member with the Center for Political Education. She holds a Masters in Fine Arts in Poetry from Mills College and a BA in African American Studies from Columbia University. A Cave Canem fellow, Maisha’s poetry has been published in the Berkeley Review of Education HOLD journal, and other small presses.